The job of a flywheel within any engine is to maintain inertia as the engine rotates. A heavy flywheel is good for this and ensures a constant tick-over at low revs, smooth acceleration and consistent cruising speeds with good fuel economy. A heavy flywheel will also prevent the engine revs increasing or slowing down quickly. However when the engine is required to change speed, increasing or decreasing revs during acceleration and deceleration, a lot of energy is needed or used to achieve this. A heavy flywheel will take more of the engine’s power to alter its speed. A lighter flywheel takes strain off the engine and allows the engine to rev more freely, as a bonus there is less weight to move so the engine is able to use more of the available power to propel the vehicle. A lighter flywheel will enable engine revs to increases and decreases more quickly. The trade-off for this is that engine inertia is reduced and this will be felt as a loss of momentum when climbing hills. 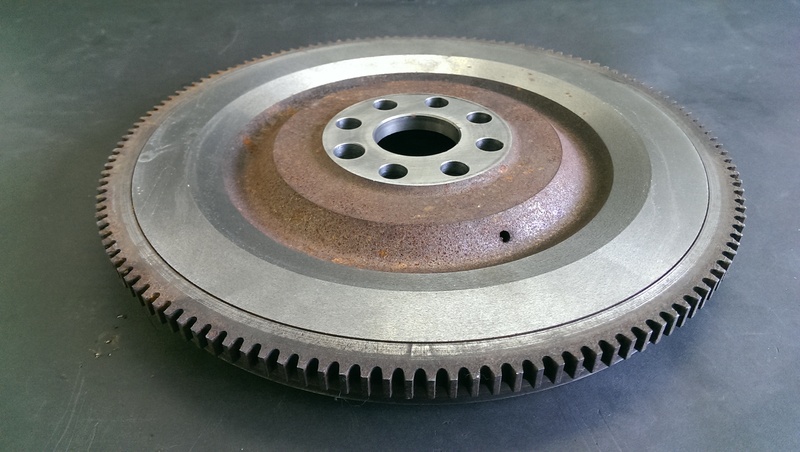 Beware lightening the flywheel excessively, particularly for road applications, as this can have an adverse effect on tick-over and drivability. With this in mind an aluminium flywheel is probably a step too far for a road or occasional track vehicle. With very little weight, engine revs will rise much faster which might be OK if you are always demanding full acceleration in a full race application but as soon as you release the throttle the revs will drop instantly and the vehicle will slow down. On the road this can be felt as surging on a constant throttle and will make the engine prone to stalling as revs fall when the throttle is closed unless a higher idle speed is used. In a road application, this can become very frustrating. A lightened standard flywheel can give you the best of both worlds. It is a compromise between an over heavy original item and a too light race type one which can give the benefits of both while having the bad qualities of neither. Done properly, a lightened flywheel can give you good performance gains in relation to costs when compared to other tuning modifications. A lighter flywheel will improve throttle response and make the vehicle feel livelier on the road as the revs will rise and fall more quickly. What is the Best Way to Lighten a Flywheel? At H T Howard we concentrate on removing much of the weight from the outer areas of the flywheel although we maintain a good ring of material at the extreme circumference nearest the ring gear as this is good for maintaining inertia. Weight removed from this area has a far greater effect than any weight removed nearer the centre. Removing material from the centre area is unnecessary and has little effect but because this area is under the greatest stress, removing material here is more likely to lead to a failure. For this reason it is the overall shape and section of the flywheel which is important and not just the total weight. When machining, we use tapers and radii to ensure that there are no stress points in the material which could cause cracking and contribute to a failure. During the lightening process, material is removed from the back of the flywheel to ensure that the clutch surfaces remain undisturbed which means that the clutch operation is maintained. However in some applications, the clutch cover does not full occupy the available surface area and in these instances it is possible to remove extra material from outside the diameter of the clutch cover with no ill effect. Flywheel materials vary from manufacturer to manufacturer and can even be different between engines supplied by the same company. Therefore, it is essential to access each job on its own merits and not use rules for minimum thicknesses across the board. Bearing all this in mind, unfortunately it is not possible to work to a weight when lightening a flywheel. We will aim to get the piece as light as possible without damaging the integrity or losing strength. Any weight removal is an upgrade and will benefit the engine performance. There are only advantages in having a flywheel correctly lightened. When a flywheel is lightened, it is possible for the whole part to distort due to the machining stresses. H T Howard advise that any flywheel which has been lightened should also be re-faced to ensure total flatness and perfect clutch operation. H T Howard recommend that all flywheels are balanced after lightening. Even though we ensure that all dimensions are symmetrical, cast materials can vary in density and may also contain voids in the material which will affect balance. While it is possible to balance flywheels as individual components, it is much better to balance all the rotating components (crankshaft, pulley, flywheel, and clutch) as an assembly.